Zecharia Sitchin translated clay tablets scribes wrote in Ancient Sumer that said giant people from the planet Nibiru came to Earth to get gold, refine it into white powder of monoatomic gold, spread it in Nibiru’s atmosphere and shield their planet. 300,000 years ago, when the miners from Nibiru mutinied, Enki, their Chief Scientist inserted his genes into the genome of a local human, Homo erectus, who’d survived ancient extinction events on Earth to make mine slaves–our ancestors. 13,000 years ago Nibiru neared and warmed Earth and the Antarctic icesheet slid toward the South Sea. The ETS knew the worldwide Deluge would result but Enlil-Yahweh, their Commander, decided to let all us hybrid Earthlings drown. 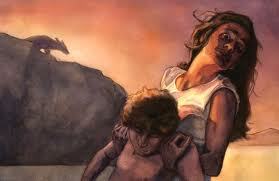 Enki managed to save his hybrid son, Ziusudra. Enlil decided the Nibirans would rule us Earthlings through Ziusudra’s descendants. Enlil’s faction nuked their own spaceport on the Sinai Peninsula in 2024 BCE rather than let Enki’s son Marduk and his Earthlings, the Babylonians, take it. But Enlil’s agents (his son Ninurta and nephew Nergal) accidentally decimated their own Earthling subjects in Sumer from a nuclear storm that radiated Iraq. General Abraham slavishly obeyed the Nibiran Enlil, Commander of the goldmining expedition from the planet Nibiru to Earth. 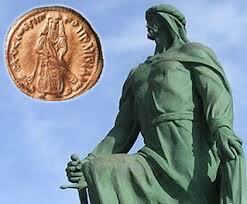 Enlil hid the vision that led him to choose Abraham as general of his cavalry. Abraham descended from our hybrid Homo Erectus-Nibiran-Homo sapien ancestors who slaved for the Nibirans. Nibiran scientists on Earth–Enki, Ninmah and Ningishzidda created our species. Their fellow mining personnel trained us hybirds to serve them in their temples, gardens, harems and armies. 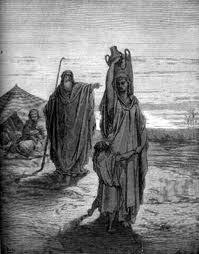 Abraham descended directly from Ziusudra (Noah), the son of Nibiran Chief Scientist Enki and Ziusudra’s son Shem. In 8650 BCE Enlil ordered Shem’s descendants to rule Canaan, the area north of the Sinai Spaceport. But descendants of Shem’s brother Ham, whom Enlil ordered to stay to the south and west–in Africa (the rival Enkiite lineage’s area) took the Canaan strip of the Arabian Peninsula. Enkiites Marduk and his son Nabu made allies among these Hamites for Marduk’s push to wrest the Sinai Spaceport from Enlil’s son’s son, Utu, Enlil’s boss of the astronauts and scientists running the spaceport. Enlil chose Abraham, a royal of Ur, who had married his half-sister, Princess Sarai (her name’s later changed to SARAH) as his principle Earthling agent. Abraham descended from Ziusudra’s son Shem, was perfect to re-establish Enlil’s rule of Canaan, protect Sinai and rule the Hamites. Abraham’s father Terah served as High Priest in charge of Astronomical knowledge at the temple of Enlil’s son Nannar in Sumer’s capital, Ur. 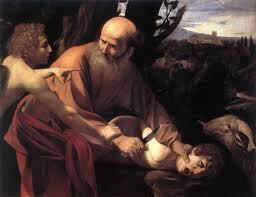 Terah trained son Abraham for unquestioned obedience to Enlil. Enlil ran the gold transshipment to Nibiru and led the ENLILITES, the dominant lineage on Earth. Enlilites were the senior lineage in Nibiru’s Royal Clan descended from Nibiru’s King ANU. Enlil commissioned Abraham to defeat the hybrid armies of Enlil’s rivals–the ENKIITE lineage (also within the Anu clan) on Earth. The Enkiites were led by Enlil’s half-brother Enki, Enki’s son Marduk and their descendants. Enlil ordered Abraham, Regain control of Canaan and keep Marduk and the Enkiites from the Spaceport. Enlil gave Abraham land and riches until he was the richest man of his time. In 2048 BCE Enlil ordered him to Canaan and to save Sinai . The Commander bought Abraham the best chariots, finest horses, 380 well-trained soldiers and weapons that “could smite an army of ten thousand men in hours.” Enlil sent Abraham, then 75 years old, and his nephew Lot to the Negev drylands bordering the Sinai [End of Days: 73]. In 2047 BCE Enlil sent Abraham and Lot to Egypt for more men and camels. 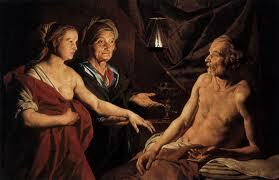 Abraham’s wife, Sarah, was “very beautiful. Abraham asked Sarah to say that she was only his sister lest the Egyptians kill him so that they can take her.” Pharaoh Zoan wanted Sarah. 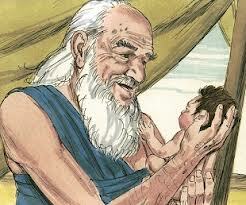 He showered Abraham with gifts of livestock and servants so Abraham would give him Sarah. Abraham let Pharaoh put her in his harem. So Enlil sent a plague [he loosed germs on Egypt] to punish Pharaoh for taking Sarah, though Abraham told Pharaoh Sarah was his sister and hadn’t told him that Sarah was his wife. 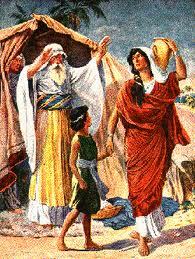 When Zoan learned Sarah was Abraham’s wife, he returned her to him. Zoan feared Enlil would harm Egypt further if Abraham stayed there. 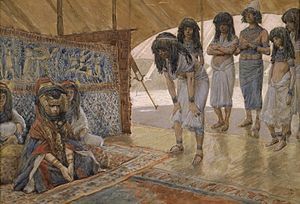 The Pharaoh gave Abraham the Egyptian Princess Hagar as a second wife and ordered him, Sarah, Hagar and Abraham’s cavalry out of Egypt with all the wealth Abraham had acquired there. In 2041 BCE Abraham and his cavalry blocked the Elamite cavalry from the Spaceport. The Elamites had overrun Sumer while Ninurta worked with his brother Adad/Viracocha in Peru, where they built an alternate Enlilite airstrip on the Nazca plains atop the Andes. Abraham rescued Lot, whom the Elamites, as they retreated west of the Jordan River, had taken hostage from the Nabu-friendly city of Sodom. Enlil, as a reward to Abraham for his help controlling Canaan, promised him, at age 86, countless descendants. 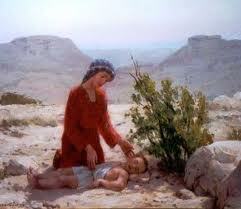 But old Sarah didn’t conceive with him. 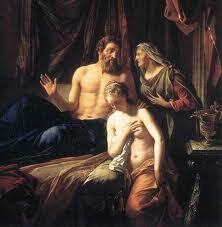 So she told him to beget a child with Hagar. After the Enlilites nuked Sodom, Gomorrah, Admah, Zeblim and the Salt Sea, Abraham moved to Canaan, but to avoid the hills overlooking the region whose populace he’d identified for bombing, he moved south, to Gerar, realm of King Abimelech. “However, Enlil made Sarah infertile, and though she lived awhile in Abimelech’s harem she didn’t conceive. Enlil visited Abimelech in a dream, told him the truth and, acknowledged Abimelech’s innocense. Abimelech complained to Abraham, who said he didn’t exactly lie, since Sarah was his half-sister. Enlil made Abimelech restore Sarah to Abraham. Abimelech apologized to Abraham and gave him livestock and servants. The King told Abraham to live anywhere in Gerar. 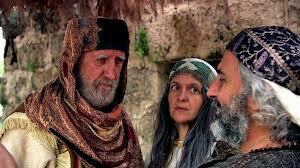 Abimelech also gave 1000 pieces of silver, livestock and servants to Abraham. When Abimelech’s men took the well at Beersheba from Abraham, he complained to Abimelech, who apologized. Abraham then set aside seven ewes as to signify that he dug the well. 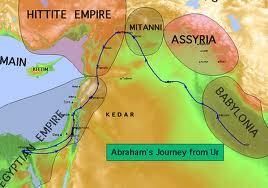 Of Earthlings loyal to the Enlilites (Ninurta, Nannar, Adad, Utu and Inanna), only Abraham and his cavalry survived. His band lived because Enlil had sent it to the Negev and Canaan to guard Sumer from Marduk’s forces in Egypt and Lebanon. Enlil wanted his surviving Earthlings branded. 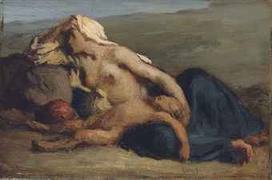 Abraham’s aged Principal Wife and half-sister, Sarah, thought herself too old to conceive an heir for Abraham, so she told him to beget a child with Hagar, the Egyptian princess the Pharaoh’d given him. 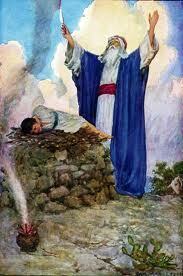 Abraham raised IS-MAEL, the son Hagar bore, as his heir, due–all thought–to rule Canaan. But Enlil altered Sarah so she could conceive, following the Anunnaki preference for men to marry their half-sisters. 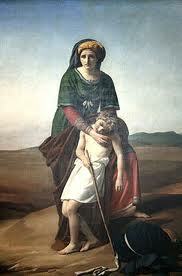 The boy Sarah would bare, Enlil told Abraham, must replace Is-Mael, Abraham’s son with Hagar. Enlil agreed. He told Abraham, “Heed Sarah. Your descendants shall spring from Isaac. 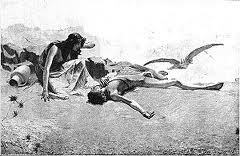 Ishmael, son of the maidservant too shall a nation begat, for Ishmael too springs from you.” Enlil told Abraham “Evict Hagar you must.” Enlil thus tested Abraham’s loyalty and drove a wedge between him and Hagar. 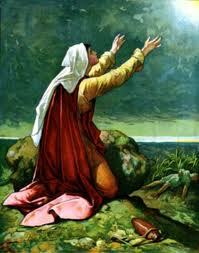 Abraham gave Hagar bread and a water skin and left her and Ishmael in the Beersheeba wilderness. 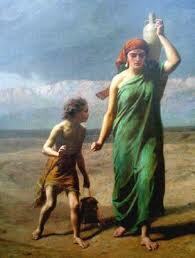 Ishmael became the genitor of the Arabs who to this day compete with the descendants of Isaac for Canaan.